CHICAGO (AP) Indiana’s July trade that sent All-Star Paul George to Oklahoma City looks pretty good for the Pacers at the moment. 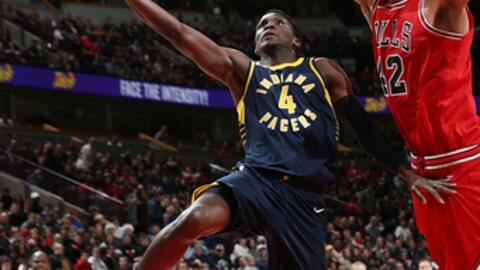 ”This was huge, just to kind of get our mojo back a little bit,” Oladipo said. The 25-year-old Oladipo was 11 of 20 from the field and finished with six assists, six rebounds and two steals, continuing his strong start. The Pacers also got Domantas Sabonis in the deal with the Thunder. After giving up an average of 115 points during its losing streak, Indiana held Chicago to 39.8 percent shooting in one of its stingiest defensive performance of the season. Bojan Bogdanovic made six 3-pointers and scored 22 points for the Pacers, and Thaddeus Young finished with 13 points and eight rebounds. Pacers: NBA Commissioner Adam Silver said Indianapolis is in contention to host the All-Star game in 2021. Silver was in Chicago for Friday’s announcement that the city will host the 2020 All-Star game. … Sabonis (calf) returned from a two-game absence with eight points and nine rebounds. It was just the fifth time this season Sabonis and Myles Turner were active in the same game. McMillan said he plans to continue to put the two centers on the floor together. Bulls: Robin Lopez followed his 10-for-11 showing in Toronto by missing his first six shots against the Pacers. He finished with three points on 1-of-7 shooting. Silver said the Bulls handled Portis’ suspension for injuring Mirotic ”the right way,” and the league did not need to step in as a result.